The shooting happened in the St. Louis suburb of Berkeley. A man was shot and killed by a police officer Tuesday in Berkeley, Missouri, authorities said -- sparking new unrest in a region already reeling following an August police shooting a few miles away in Ferguson. The town's mayor worked to calm the unrest this morning by saying that there are major differences between the two cases. "All of us are saying the same thing: 'It's a white policeman killing a black man, and when does this stop?' I can assure you that is not what happened last night," Berkeley Mayor Theodore Hoskins said this morning. Hoskins said that he has watched the video of the incident and, though they are going to complete two thorough investigations by both the local police and the county police, he differentiated Tuesday night's shooting from other recent cases. "You couldn't even compare this with Ferguson or the [Eric] Garner case in New York," said Hoskins, who is African American. "The Garner case in New York, they had the video; Ferguson they did not. We have the video. I can assure you what is on the video, we're going to use." The latest shooting happened at 11:15 p.m. Tuesday at a Mobil gas station, St. Louis County Chief of Police Jon Belmar said in a morning news conference. Belmar said police visited the gas station when a report of a larceny came in. The victim, who is 18 years old that has not been officially named by police, pointed a gun at the officer which sparked the deadly shooting, Belmar said. "Bad choices were made," Belmar said. "This individual could have complied, he could have ran away, he could have dropped the gun." The shooting sparked a new wave of unrest in the region, which has been wracked by anxiety following the August shooting of Michael Brown, 18, in nearby Ferguson. Following Tuesday’s shooting, a crowd of 200 to 300 people swarmed the gas station, with four people arrested and a police officer sustaining a leg injury, said Belmar, who is white. (David Carson/St. 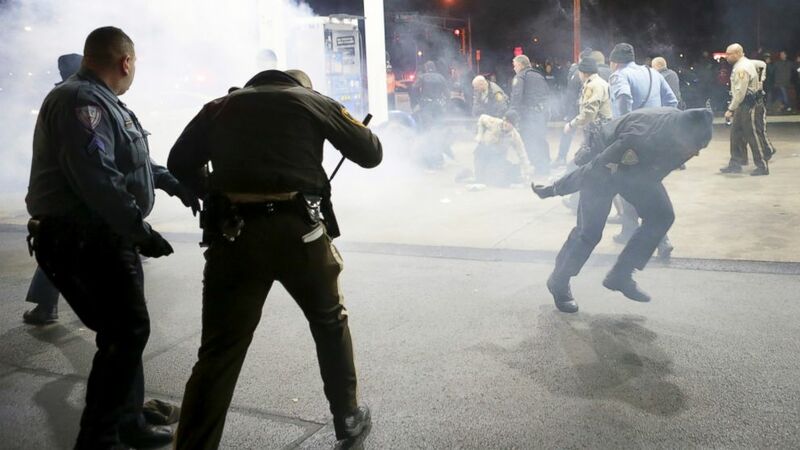 Louis Post-Dispatch/AP Photo) Police try to control a crowd, Dec. 24, 2014, on the lot of a gas station following a shooting in Berkeley, Mo. St. Louis County Police released surveillance video today showing the moments before the shooting. The officer can be seen parking his vehicle, and a conversation ensues. The man’s arm appears to be raised -- but the video is inconclusive, captured from the side of the building a considerable distance away. Police also released a second and third video this afternoon showing surveillance footage captured from other angles of the gas station parking lot. However, in the second video, neither the teen nor the police officer are clearly visible in the footage at the moment the shooting happens, but one man can be seen running away. In the third video, the police officer can be seen stumbling backward as he fires shots and then falling. Police said that out of respect for the teen's family, he has been cropped out of the clip. Belmar said the officer was assigned a body camera on Tuesday, but was not wearing it at the time of the shooting. Additionally, the vehicle's dashboard camera was likely not in use. (David Carson/St. 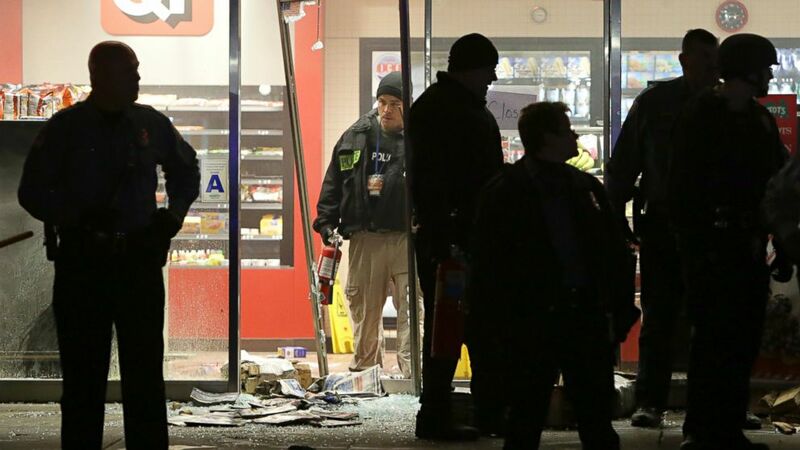 Louis Post-Dispatch/AP Photo) A police officer with a fire extinguisher stands in the broken out entry to a QuikTrip, Dec. 24, 2014, following a shooting nearby in Berkeley, Mo. The officer -- a six-year veteran of the Berkeley police department, whose name will not be released until after the investigation but has been revealed as 34 years old and white -- fired three rounds, with one round striking the victim, Belmar said. Belmar declined to release the victim’s name or race, but said the man’s criminal record includes assault and armed robbery charges. Gov. Jay Nixon, who coordinated the state's response to the Ferguson protests, released a statement in support of the officer this morning. "The events in Berkeley are a reminder that law enforcement officers have a difficult, and often dangerous, job in protecting themselves and law-abiding citizens," he said in the statement. Toni Martin identified the victim as her son, Antonio Martin. Toni Martin told reporters at the scene that her son was with his girlfriend at the time of the shooting and refuted police claims that her son was carrying a gun. He was trying to get his life back on track after getting expelled from school, she said. "He was a good young man," she said.